The Rôtisserie des Chevaliers is an elegant restaurant at the Kulm Hotel St. Moritz in Switzerland, has 14 points GaultMillau, and features classical French cuisine by Executive Chef Hans Nussbaumer. The décor at the restaurant features a salmon-colored domed ceiling, antique weaponry hang from the ivory walls dressed with wainscoting. An intricate black wrought iron chandelier hangs from the center of the room, and together with wrought iron lamps with cream shades softly illuminate the intimate dining room. Red, green, blue and yellow treatments frame the windows and there is a red and green tartan plaid carpet on the floor. Tables are draped with double linens of blue topped with white, and adorned with silver candlesticks with glass shades and votive candles, with miniature fuchsia colored orchids set in glass bowls dressed with pearls. Chef Hans Nussbaumer knows how to tease the guests' palates, and when he sent Edward F. Nesta and I an Amuse Bouche of a square of red tuna with olive oil, sesame seeds, sea salt, and green olive tapendade with a crunchy crostini, we knew that a very tasty evening was ahead of us. Paired with an aperitif of Möet and Chandon champagne, it was a delightful way to start the evening. There is something about oysters that has aficionados counting down the days to the months with the requisite "r" in them, and since Edward and I had dinner at the restaurant in late January 2008, he had to indulge in a selection of oysters as a starter. The six oysters were elegantly presented on a bed of crushed ice on a round silver platter dressed with pickled red onion, garnished with a lemon set on a bed of seaweed in the center of the plate, and accompanied with miniature dark and white striped bread. The service was formal and attentive, and after Edward had finished his oysters, the waiter brought him a finger bowl. While Edward cannot say no to oysters, if there is lobster on the menu, I always know what I will be having. 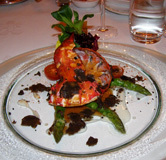 The lobster salad was gorgeous, with the lobster cut and resting in its shell presented on a round artglass plate on a bed of asparagus spears with truffle shavings decadently scattered around the plate, and miniature greens standing in a sesame pastry cone with cherry tomato halves. The sommelier paired our starters with a Giovanni Rosso, 2004, Langhe, Sauvignon Blanc, from Piedmont, Italy with a slate, earthy nose with mineral notes that was crisp on the palate. For his second course, Edward selected the Sole Farci, which was perfectly seasoned and stuffed sole presented in a square bowl with mussels and champignons au gratin, topped with cherry tomatoes, and accompanied with spinach and rice. 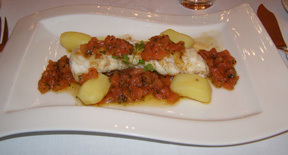 I continued with Monkfish attractively presented on a white wave rectangular plate with the monkfish sautéed in olive oil, and arranged on a bed of tomato concasse with more of this tasty sauce carefully spooned on the fish, boiled potatoes anchored the corners of the plate, and a side dish of spinach accompanied the fish. We finished the evening with a refreshing Sorbet Limoncello, which was lemon sorbet presented in a chilled martini glass garnished with a red raspberry, mint leaves, and a dark chocolate flag, with a healthy drizzle of Limoncello. Please note that the Kulm Hotel St. Moritz is open from December until mid-April and from late June until mid-September. Read other articles on the Kulm Hotel St. Moritz and St. Moritz in the Destinations, Hotels and Resorts, Chefs' Recipes, Gastronomy, Spas, and Adventures sections. For information on Arosa, please visit the website: www.Arosa.ch. For information on Lucerne, please visit the website: www.Luzern.org. For information on Interlaken, please visit the website: www.InterlakenTourism.ch. For information on Bern, please visit the website: www.BernInfo.com. For information on Zurich, please visit the website: www.Zuerich.com.